This completely renovated holiday home is set in a magnificent location. 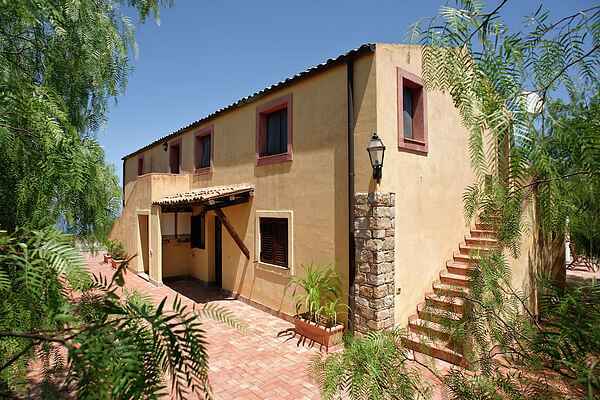 Situated on a mountain the house offers a fantastic view of the surroundings including Cefalù and the Tyrrhenian Sea. The spacious holiday home has been divided into four apartments, each with its own terrace. The apartments are tastefully furnished and have covered parking spaces. The house has a sizable communal garden with large swimming pool from which you have fabulous views of the sea and surroundings. The house borders on to the stunning nature reserve Le Madonie, where you can do some fabulous walking. Besides going for walks, you can go horseback riding and play golf; the riding school is only 1 kilometer away and at 10 kilometer distance you'll find a superb 18-hole golf course. All in all a perfect location for both nature-lovers and sport enthusiasts. The picturesque town of Cefalù is 15 kilometers away. The town was founded in the 4th century BC. It has a maze of alleyways and pretty little streets. A bit further up in town lies the beautiful cathedral with a lovely quaint square. Behind the cathedral is an impressive chalk rock; via a footpath you climb to the top from which you have a breathtaking panoramic view. Cefalu at 15km is a picturesque seaside village on the north coast of Sicily, founded in the 4th century BC. It is the ideal place to stroll and relax for a day. Cefalu is a maze of alleys and streets where, if you look up will see a typical Italian scene: drying laundry on the lines. The cathedral is a bit higher in the village on a cozy square dominated by palm trees and terraces. Behind the cathedral you will see a huge limestone rock, La Rocca. This rock you can climb through a trail and at the top you have a phenomenal view. It is the time to relax behind a delicious glass of wine in one of the many wine bars in the village. Hopefully you have brought your towel, because from Cefalu you walk right on to the beach. For sports enthusiasts there is a riding school at 1 km and 10 km away is the 18-hole golf course Campo Felice di Roccella. The well-known cities such as Palermo (60 km) and Messina (160 km) are within easy reach. On the way to these cities we advise you to take the coastal road. You will be amazed at every turn by the beautiful views and the clear blue sea.